We work with all sorts of companies and it often strikes us just how generous our clients are and how many genuinely want to give something back to society. We have a similar ethos; we want our clients to grow and achieve the success that they deserve but at the same time we want to support communities who are struggling. That is why we partner with Buy1Give1, a fantastic non-profit making organisation which supports 600+ high impact charitable projects across the developing world. 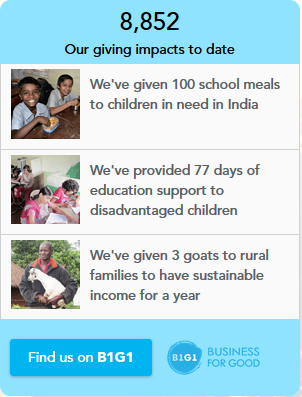 If you decide to work with us we will sponsor another micro project in the developing world. By working with us you know that life changing work is being supported around the world. We will continue to support Buy1Give1 to change the lives of people who need that extra help.